Waxing Moon is a company representing artists and practitioners of mask making, mask performance and theatre education. Currently we serve theatre companies, individuals, and universities throughout the United States. Our performances invoke theatrical traditions as old as the moon to launch new ideas and engage audiences of all ages; traditions such as Commedia Dell’Arte, vaudeville, clown, and full-faced mask performance. Our mission is to use mask play and physical theatre to bring theatrical size and direct audience interaction back to contemporary stages. On the stage, in the classroom, and in the studio, Waxing Moon thrives on collaboration, and we work hard to facilitate strong connections for communication. To see what folks are saying, click HERE. Tara is a Baltimore-based theatre artist that at times wears many different hats: performer, director, designer, movement instructor, producer, singer, writer, activist. 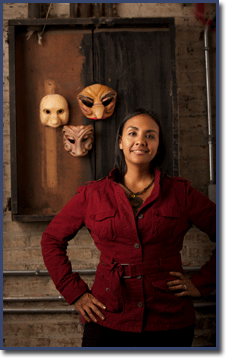 She has worked with local companies such as The Chesapeake Shakespeare Company, Faction of Fools, Distilled Theatre Company, as well as companies beyond the Baltimore/Washington region, including The San Francisco Mime Troupe, The Dell’Arte Company and Sojourn Theatre Company. She received her MFA from the Dell’Arte International School of Physical Theatre with an emphasis on Ensemble-generated work, her BA from UMBC in performance, and a certificate of achievement for mask making and performance instruction from the Sartori Centro Maschere e Strutture Gestuali. Tara is the Artistic Director of Waxing Moon Masks performance company and an instigator of new works. Since their initial performance in January of 2012, WMM has produced three shows for the Baltimore community: One Wish Glitz, a staged reading of a new Commedia play by Kristin Harrison; Take This Medicine!, a clown play at the UnSaddest Factory 10 Minute Play Festival; and Larval Project, an original devised full face mask work showing at Centerstage as part of their celebratory theatre festival called 50fest. Tara makes masks between rehearsals at home with her daughter Nadya and husband Aaron, and in the Spring she grows her own lettuce. Click HERE to download a copy of Tara’s resume. Aaron is the mad scientist at Waxing Moon. With his great aptitude for understanding the fundamental interactions of the material world, his work transforms our mask designs into durable, high quality products. Currently a Business student at the University of Maryland, College Park, Aaron brings both Entrepreneurial as well as Intrapreneurial skills into the team. 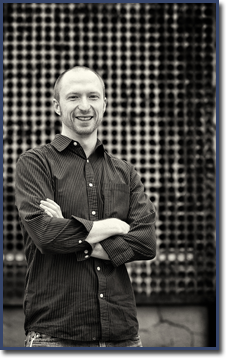 As an Intrapreneur, his work influences manufacturing and business processes, strategic planning rapid prototyping equipment design and construction. As an Entrepreneur, he generates new ideas for product offerings and new markets to expand into that fit within the overall strategy of the company.